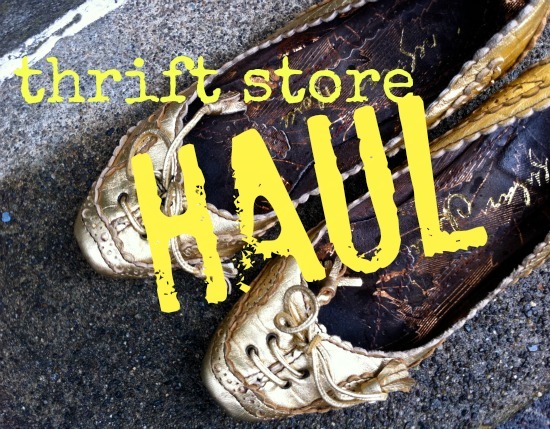 One of the most viewed videos over at YouTube are THRIFT STORE HAULS. That's right, people upload videos sharing their purchases. I love La Dama's haul videos- because I adore her, but how strange that strangers are watching other strangers talk on about their thrifty finds. Here's my Thrift Store Haul blog post: I'm going to share some of my recent thrift store scores with you! First up: the Lemon Drop Up-Top. 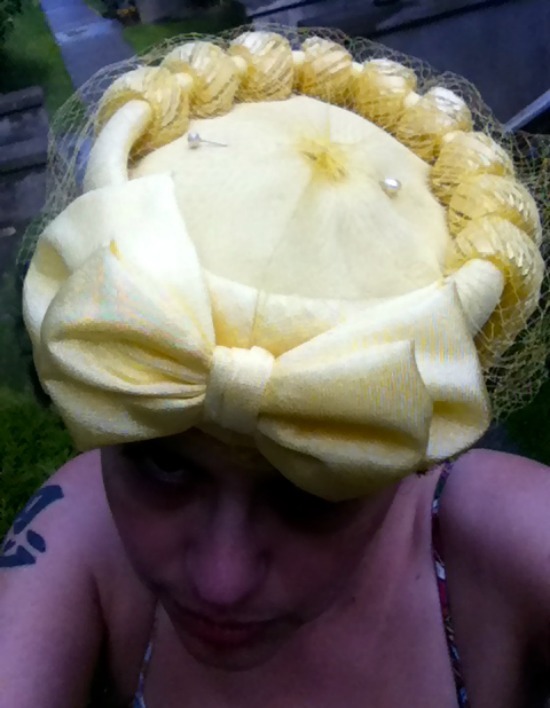 How tasty is this lemon yellow vintage 1960s hat? This is a treasure I picked up from a little hole in the wall charity shop in my neighborhood called Secondhand Rose. Donated by one of the nice volunteers who work there, I was told that it's from her 1968 wedding; as worn by her mother-in-law. I also bought one of her bridesmaid dresses, a sweet yellow and lace maxi, hand sewn for one of her besties. I LOVE it when you get the story behind a vintage find, especially when it's as sweet as this. She's been happily married ever since, so I'm sure there is good luck in this sweet confection of a hat! Egyptial Revival. This unique bangle has been in my possession for years but I recently cleaned it and was surprised to see so much delicate detail that was hidden under decades of grime. 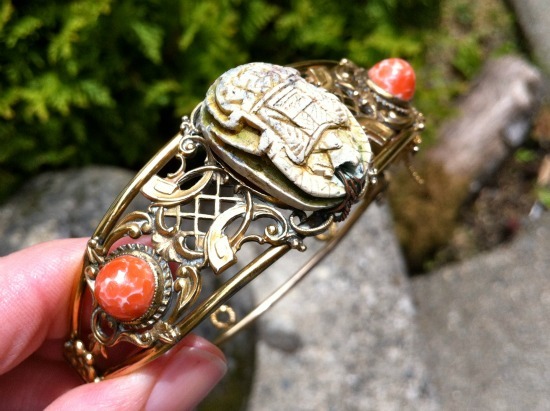 It's probably a 1920s piece, a faience scarab set in an Egyptian Revival Art Deco setting. I scored this at one of my favorite Sacramento shops- Thrift Town over 5 years ago, it is truly a treasure! Look for a listing of it soon in the Etsy shop. Spring Bouquet. 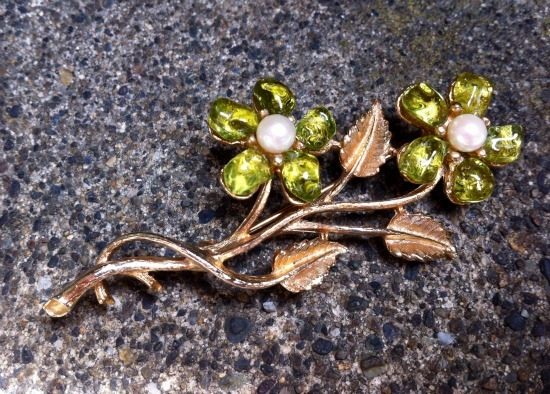 You know I adore brooches and florals, so this lovely 60s era brooch was quickly plucked by me at a recent Value Village sale. Pearly and peridot beads form the petals on a charming gold tone stem- I think I paid $5 for it, and am trying my hardest not to keep it for myself. Double Take: Look by Marc Jacobs loafers. These gorgeous kicks were 50% off, and a major score when I picked them up for $5. They were promptly listed on eBay and just sold last night. A women's size 11, I'm glad these glam pony hair and patent leather loafers found somebody big enough to fill them! Golden Slippers. Cinderella would be jealous of my amazing find: Irregular Choice gold leather kitten heels. A $200 pair of shoes picked up for under $12. They fit me perfectly- so if they don't sell by next week, they may just wind up back in my closet. Patent Platforms. And yet another shoe score from Value Village, these platform beauties have been something I've been lusting after, but haven't the budget for a brand new version of them. These trendy platform creepers turn my ankles into cankles but I don't care! I love how edgy they look with my vintage dresses. Nearly new, and bought 50% off of $9.99, cankles or no cankles, these patent leather beauties are mine, mine, mine! So do you like my thrift store haul? What great secondhand find have you scored lately? Don't Forget!!! Next Wednesday (June 12th) is SHOE SHINE! The community event where you share your favorite shoes with all! So snap a pic of your rocking the kicks that make you feel beautiful, confident, and stellar, and be sure to post it here next Wednesday. Amazing scores, Bella! No wonder thrift shop finds are popular on YouTube - I had no idea. Of course every loves a good treasure hunting story. Your shoe finds are spectacular. I've often had good luck at VV too. Great jewellery. That's a section I usually overlook. Not any more! fabulous finds!, love that 60's hat with a story to tell!! I'm not usually successful when thrifting, there're few opportunities here in my neck of the woods! I love the story behind the hat! that's the beauty of the British car boot, you usually buy from the original owner and get some kind of provenance! It was a good week for thrift stores!! I made out like a bandit, too. I love the jewelry! What gorgeous pieces! Totally fun finds yourself, girl! That hat is a treasure. Even it you never wear it, it's like a piece of art. She shoots!!! she SCORES!!!! Great Haul Bella!!! Great shopping, Bella! What a fab little hat, and the jewels are sweet. I wore Mr. Blue Kitty pin today, love him. DId not know that Thrift Store hauls were so popular. But of course, I totally understand that it would be. BEAUTIFUL hat. Also, another honorable mention to your blog from Girlie Blog. Thanks for being so inspirational. I totally LOVE that hat!!! Love the Music! Wish that those gold shoes were my size. Hope to participate in Shoe Shine. what a great haul! so many nice treasures! Oooo you scored amor! I love the gold shoes and can't wait to see those dresses. let me know if you find cheap bakelite bangles. I think I will be boot saleing soon. I can't wait to shop with you and see your spot at Atlas! 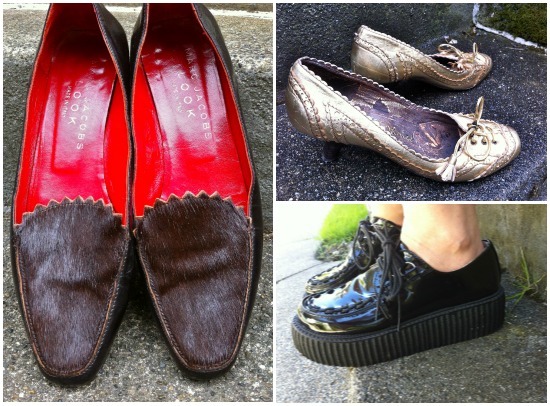 You did score and the knock off creepers are my favorite score but those golden shoes are also pretty fierce! See ya soon! The brooch and bracelet are fabulous, as is that sweet little hat - I love getting the personal story behind vintage items. A nice yellow hat; so nice to know where the origins of our thrift finds. Would love to see you wear the bridesmaid dress. I enjoy some of the thrift store hauls videos but most of the time the girls talk so much about themselves that by the time they make to the clothes I'm already bored! Awesome finds! Especially on the shoes. I love the creepers. I found a silk dress by the Society for Rational Dress yesterday. I can't wait to wear it.